Leading Manufacturer of horizontal plough shear mixer and wall putty making machine from New Delhi. Horizontal Plough Shear Mixer is widely use for mixing powder and powder and powder and liquid, powder and granule. 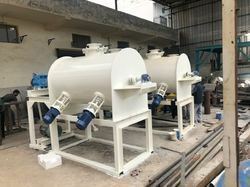 When mixing solid with liquid, liquid spraying or aerosol spraying system is optional. We are humbled to declare ourselves as the manufacturer, supplier and trader of Wall Putty Making Machine.